Chair Entertainment’s maiden voyage into the App Store was initially met with mixed reception. While some praised its gorgeous graphics, hack ‘n’ slash gameplay, and abundance of weaponry, others criticized its linearity and lack of free-roaming ability. Now, almost five months on and with a substantial content update under its belt, Infinity Blade has to be considered as iOS’s premier outing. 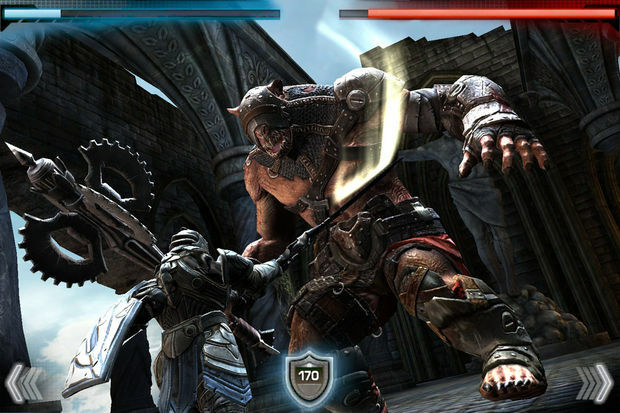 Infinity Blade is an arcade hack ‘n’ slash adventure game integrated with various RPG elements. Your task is to traverse dungeons and courtyards, battle beasts, and collect weapons en route to a final showdown with the God King. Simple taps allow you to navigate your surroundings, interact with items and treasure chests, and engage with enemies. Once in battle, swipes of the screen are mirrored by your array of weaponry. While Infinity Blade’s controls work great – the fight mechanics, especially – the ability to free-roam – similar to tech demo Epic Citadel – would be nice. Fights require a surprising amount of skill for a hack ‘n’ slash title and you have to tailor your weapons for each beast. Although this initially keeps battles fresh, they do start to become stale over time – albeit slowly – when you learn each beasts attack pattern. Fortunately, neither is a major issue, failing to overshadow other areas of the game. Weapons used in combat can be mastered through the use of experience points (XP), producing a skill point that can be spent on improving your health, attack, shield, or magic. 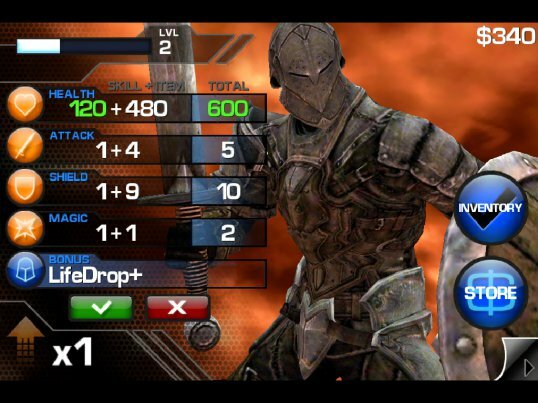 This is Infinity Blade’s ‘just one more fight’ – especially for completionists. Since version 1.21, Infinity Blade has contained a lot more freedom and a greater sense of exploration, thanks to new areas, multiple paths, and the reliance on key objects to progress – diminishing the argument over linearity. So, perhaps the only disappointing area of Infinity Blade is the long promised – but still absent – presumably forthcoming multiplayer mode. 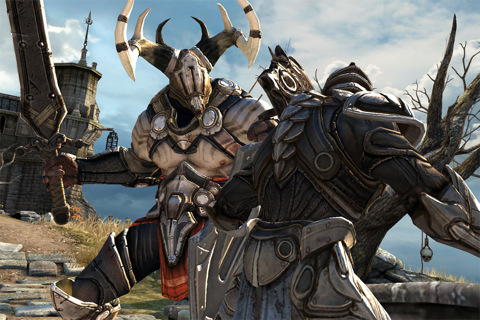 Infinity Blade was built using Epic’s Unreal Engine 3 and as a result, looks gorgeous – especially on the iPhone’s Retina display. Combined with replayability – thanks to a newly added NewGame+ mode and Game Center integration – and genuinely fun gameplay, Infinity Blade is a title for anyone who plays games on their iDevice.